The Betrally brand has been active since 2010 and has expanded its operations quickly, covering many major European countries and now, thanks to Betrally India, the Indian subcontinent as well. Betrally is one of the biggest brands to establish a betting site in India, indicating just how far online gambling has come in this country and just how well it is doing. Betrally India is exclusive focusing on the Indian market, so bonuses are not available to other countries at the moment. If you are not Indian maybe you should start at another site. However for Indian players this site will make you feel right at home. Even though this is a new site, the big and serious companies associated with it makes it much more trustworthy than other freshly started bookmakers. There is a huge number of betting markets on Betrally India. It’s like any other top sportsbook in this sense, with everything from American Football to Volleyball. The main thing that separates them are their focus on cricket and other sports and leagues that are big in India. 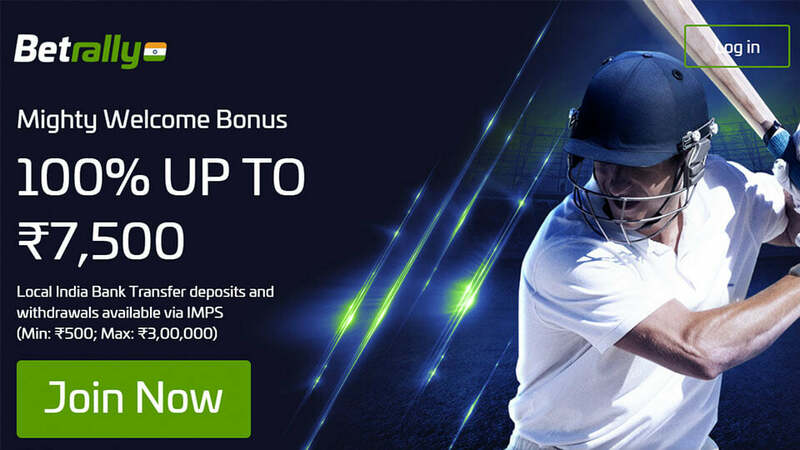 The bets on each individual game are just as diverse as you will find on sites like Bet365, and you will find a host of games to bet on every day. Top batsman, highest individual score, coin-toss winner to name a few. In total, there are between 30 and 34 sports here, which means that a lot of niche sports have been made room for, as well as the most popular ones. Unless your tastes are very obscure, then you should find what you are looking for here. If you want a change from cricket they have a nice kabaddi section. One thing to note: Even though Betrally India accepts all these payment options doesn't automatically mean that your bank or card company will let the transfer through. Still, worst case scenario is probably only cancellation of the transfer with the money returned to you. When depositing with Neteller: Just enter the email you have registered with Neteller, and secure ID is the 6 numbered code you chose on the Neteller site. If you have two factor authentication enabled you should enter the 6 numbers from your authentication app instead. We recommend enabling two factor authentication whenever its offered. Withdrawals are processed quickly, after you have verified your identity and address, which can include sending a pictures of passport, utility bill and more. Our opinions of Betrally India's customer support have been very solid so far. They are quick to reply and they are very helpful, so if you need any assistance in any part of the process on their site, you should not hesitate to contact them, usually gets the job done in a swift manner. There have been some issues people have had with their customer service which we have read around at different communities, but we ourselves have yet to experience this, but you should be warned that you might come across some CS representatives that might have a bad day. Try to get a hold of someone else, or if all else fails, try to contact us and we would be happy to help communicating with them for you. Whenever we have contacted customer support with questions we have received a reply within minutes. Example: making a mistake when claiming the bonus was fixed in 5 minutes after contacting support. Livechat is readily available while looking around their page, making it easier to coordinate when working on a specific problem. Add to this that you don't need any verification before starting a chat. And you get one of the more comfortable customer service interactions you can find. Their live section is up to par with any other site. For football you even have a visualisation of the matches highlights as they occur. Even though they dont have an app, surfing the site feels so smooth that you dont really miss it at all. Betrally India is an online bookmaker created with the focus of catering to the Indian population. They also operate the Betrally site, but this is not very accessible and is restricted everywhere from the US to the UK. The Betrally India site is perhaps even more restrictive, but only if you live outside of India. Their main site was at its biggest in Eastern Europe and was particularly popular in Poland, with 80% of their visitors hailing from that European country. 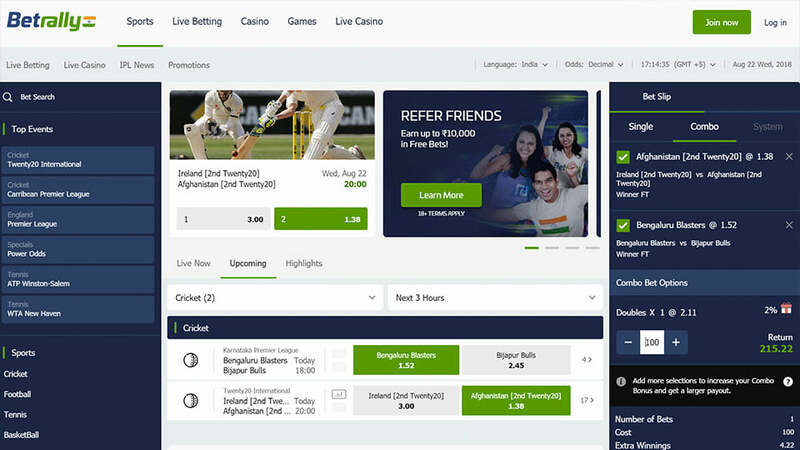 Betrally India is basically a carbon copy of that site, but one that focuses on the Indian market, with support for different languages and currencies and with a strong selection of betting markets for cricket, kabaddi and other sports that are popular in India. Betrally India is still an up-and-coming company, with plenty of room to grow. There seemed to be some hiccups with customer service and some facets that could be changed, but we considere these as part of a growing process and believed they have been nicely remedied. Combined with the fact that they are focusing their site on purely India makes it a site you must check out if you are from that region and are looking to gamble online.